The Sarabande Writing Residency at Blackacre Conservancy and Historic Homestead offers two writers each summer a chance to develop their current projects within the conservancy's three-hundred acres of wooded hiking trails and meadows .At this time, we are pleased to announce our 2018 writers in residence. We are pleased to announce Danica Novgorodoff as our 2016 Sarabande Writer in Residence. She will be staying in Bernheim Research Forest and Arboretum this Fall. 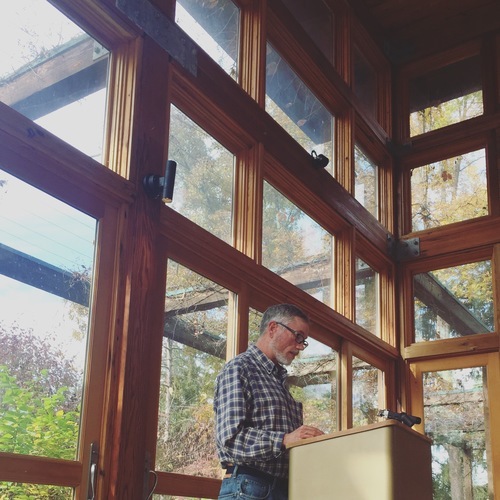 Acclaimed poet and 2015 Sarabande Writer in Residence D. A. Powell offered a reading Sunday afternoon at the Bernheim Arboretum and Research Forest Visitors Center. He read previously-published poems as well as a selection of new work, including one poem dedicated to Bernheim Forest, the 14,000-acre private nature reserve where he is spending his month-long residency. Powell is the fourth Sarabande Writer in Residence since the program was founded in partnership with Bernheim Forest in 2012. The Sarabande Writing Residency offers an annual retreat, two to six weeks in length, to a poet, fiction writer, or essayist at Bernheim Arboretum and Research Forest near Louisville, Kentucky. Residents receive a $500 travel stipend and lodging in a private, fully equipped cottage on the Bernheim grounds. Residents offer two public readings or discussions during their tenure and may devote the rest of their time to writing in Bernheim's extensive forest, gardens, and arboretum. D. A. Powell is the author of five collections, including Useless Landscape, or A Guide for Boys, which received the National Book Critics Circle Award in poetry. His honors include the Kingsley Tufts Prize in Poetry and an Arts & Letters Award in Literature from the American Academy of Arts & Letters, as well as fellowships from the Guggenheim Foundation and the National Endowment for the Arts. We're accepting summer 2016 applications until September 30! The Sarabande Writing Residency offers an annual residency of two to six weeks to a poet, fiction writer, or creative nonfiction writer at Bernheim Arboretum and Research Forest, an idyllic 14,000-acre nature preserve near Louisville, Kentucky. Residents receive a $500 travel stipend and a two- to six-week stay in a private, fully equipped cottage on the Bernheim grounds. Residents offer one public reading or discussion during their tenure and may devote the rest of their time to writing in Bernheim's extensive forest, gardens, and arboretum. The application period for the 2016 residency is August 1 to September 30, 2015. Finalists will be contacted for an interview by January 15, 2016, and the writer in residence will be named by shortly after. At that time, the awardee will work with a Bernheim representative to schedule his or her residency at Bernheim Arboretum and Research Forest. You can find more information on our submission page here. 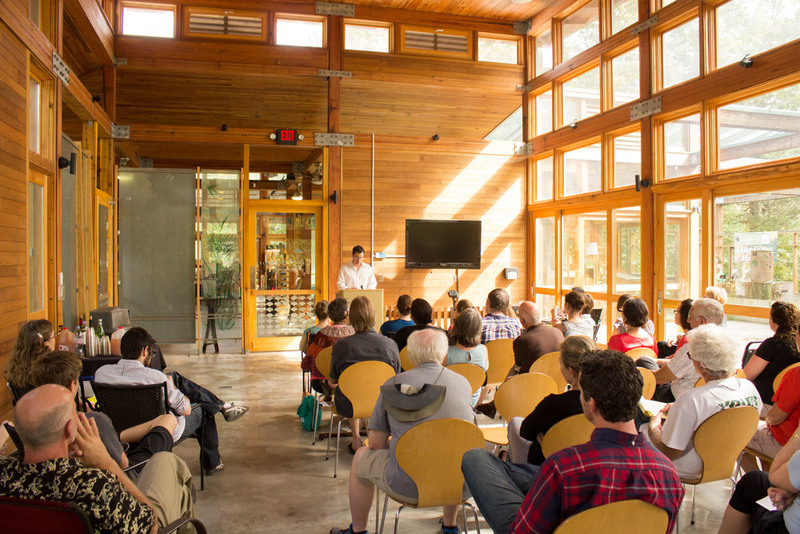 Our 2014 Writers in Residence read to a packed house at Bernheim Arboretum and Research Forest last weekend! Margaret Kimball and Christian Moody, partners, shared the residency and stayed two weeks in an artist's cottage on Bernheim grounds, writing and wandering in the extensive forest and gardens. Margaret Kimball read from "Your Body Becomes Submerged," a haunting graphic prose work that appears in this fall's issue of the Black Warrior Review. Kimball is writing a graphic memoir about childhood and place, parts of which have also appeared in Copper Nickel, Memoir(And), and South Loop Review. She has been in residence at Yaddo and is an assistant professor of illustration at Lesley University in Boston. Christian Moody read from Yolk, a novella-in-progress about supernatural happenings at an egg farm, corporate cover-ups, genetic modification, immaculate conception, and father/daughter relationships (and we cannot wait to read the whole thing). Moody's fiction has appeared in Best New American Voices, Best American Fantasy, Esquire, The Cincinnati Review, The Collagist, and other publications. He is a visiting assistant professor of English at Centre College in Kentucky. Want to be our 2015 Writer in Residence? We're accepting applications now!